"The Food and Drug Administration issued a warning letter to the company, objecting to the product's labeling, which describes the drink as 'Diet Coke with Vitamins and Minerals.' Regulators said the beverage does not have enough nutrients to justify the use of the word 'plus' in its name. According to the agency, foods labeled 'plus' must have at least 10 percent more nutrients than comparable products. Additionally, the FDA said it is inappropriate to add extra nutrients to 'snack foods such as carbonated beverages.' "
"The Food and Drug Administration has been busy this week, and I think what it is saying warrants a wake-up call -especially for women. Yesterday, the agency said it issued a warning letter to Coca-Cola noting that its Diet Coke Plus soft drink had nutritional claims that shouldn't be placed on an utterly nonnutritious soft drink. Those added vitamins and minerals don't make the beverage any more healthful than, say, Diet Pepsi, the FDA says." "He reiterated the disadvantages of the agency workers in terms of hygiene, housing, holidays and working hours. Agency staff often worked 12 hours per day for an entire month without a single day off. One worker was found to have worked 318 hours in one month. Yang said the group have photocopies of the relevant documents to support their conclusions. He said the students submitted their findings to Coca Cola but had received no direct answer. Coca Cola had published a reaction on the Internet but hadn't answered the students directly and simply denied illegal practices without addressing the charges specifically." "Coca-Cola has come under fire after a private investigation accused it of 'serious infringement' of the rights of its dispatched workers in China. 'These employees are involved in the most dangerous, intense and tiresome labor, work the longest hours, but receive the lowest wage and face arrears with and even cutbacks on their pay,' said a 28-page report written by seven university students after a month of participatory research and released in Beijing on Sunday." Coca-Cola came under fire after a private investigation accused it of "serious infringement" of the rights of its dispatched workers in China. The charges against the company were contained in a 28-page report by seven university students after a month of participatory research. The report, released on Dec. 21 in Beijing, stated: "These employees are involved in the most dangerous, intense and tiresome labor, work the longest hours, but receive the lowest wage and face arrears and even cutbacks in their pay," The students collected the information between July and August while working in Coca-Cola's bottlers in Guangzhou and Huiizhou, as well as the company's supplier in Shanghai and other facilities. Dispatched workers are employed by agencies that send them to fill "temporary, supporting or replaceable positions," according to Clause 66 of the Labor Contract Law. The report concludes by demanding that the company apologize to the Chinese people and the dispatched workers. Copies of the report will be sent to the All China Federation of Trade Union (ACFTU) and Coca-Cola China. Remember the BBC report that Coca-Cola in China was using prison labor "to work on merchandise intended for the company." Watch Video re: "Coke's refusal to debate Ray Rogers"
Watch Video re: "Ray Reveals the Real 'World of Coca-Cola' "
Watch Video re: "Coca-Cola is an anti-union Company"
"It's been a busy couple of months in Norwich as the University of East Anglia's Killer Coke Campaign joined forces with Norfolk Latin America Forum and the Jamnesty Junk Band to kick of a season of events raising awareness of the crimes of Coke both on campus and around the city of Norwich. "Activist, comedian and general inspiration Mark Thomas was in town, so what better time to launch the campaign. Mark's show was great as he recalled his experiences uncovering Coca-Cola's dubious ethical legacy from sponsoring Hitler Youth in Nazi Germany to water depletion in India to trade union busting and murder in Colombia. Norwich KillerCoke collected lots of signatures from people pledging to boycott Coca-Cola until they clean up their act. "The local group followed up the Mark Thomas show in November with a screening of the Mark Thomas' documentary about the highly unethical corporation with live music from Hazel Marsh and Chilean activist Mario Gomez. There was a prize draw with attendees winning KillerCoke t-shirts and DVDs. "On Thursday 24th UEA played host to a Colombian student activist and political asylum seeker now resident in the U.K. The audience was told of the state collusion in paramilitary violence against students, trade unionists and members of the indigenous community. 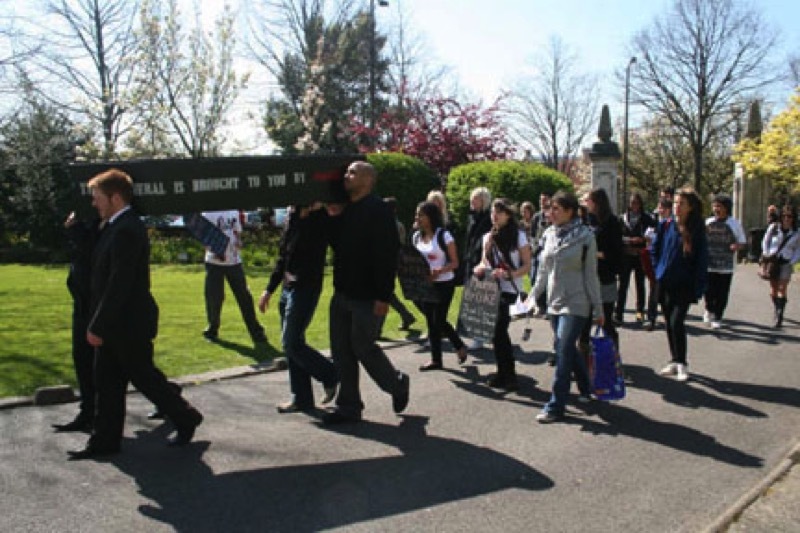 "Saturday 29th November saw the campaign take to the streets with a mock funeral. Joined by the incredibly loud Jamnesty Junk Band and over 40 volunteers dressed in appropriate funeral attire, the Campaign marched through the streets spreading the word as Norwich citizens went about their early Christmas shopping. 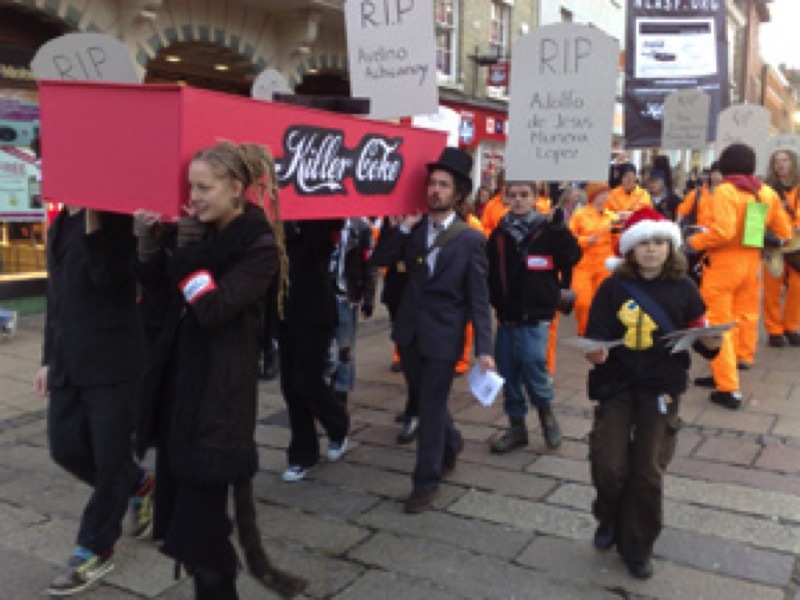 "In the New Year UEA KillerCoke will be pushing for a boycott of all Coca-Cola products on the UEA Campus and within Student's Union stores to send a clear message to Coca-Cola that we will not tolerate human rights abuses in the name of profits. Norwich KillerCoke and Norfolk Latin America Forum will also be hosting a series of FairTrade Cola tastings throughout the city, so keep your eyes peeled for upcoming events! "For more information or to get involved email killercokeUEA@gmail.com or visit www.NLASF.org." "Toronto shoppers will start paying five cents for throw-away plastic shopping bags starting June 1, Toronto council has decided. And despite a determined lobby from bottled water companies to block the measure, councillors voted to ban the sale or distribution of bottled water immediately at City Hall and the city's civic centres where contracts permit." "Toronto's decision last week to ban the sale and distribution of bottled water on city premises was a watershed moment for water justice advocates the world over. What was truly significant about Toronto's action was not that it banned an environmentally destructive product, but that it included a commitment to ensuring access to tap water in all city facilities." 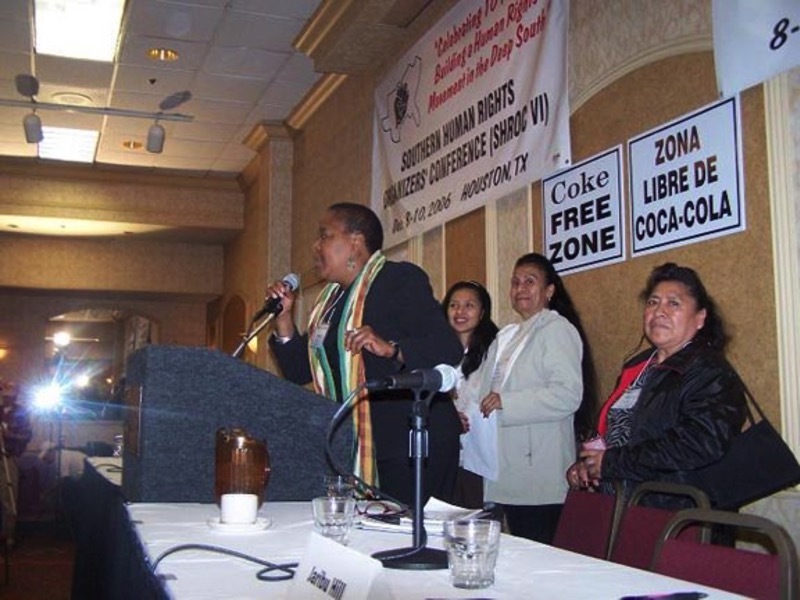 SHROC VII [Southern Human Rights' Organizers' Conference] Declared a Coke-Free Zone! We received an email today [Dec. 9] from the Southern Coalition for Social Justice: "...Just as we did for SHROC VI in Houston December 2006. We successfully got the Radisson to contractually agree that no Coke products will be served at the conference this year. SHROC will be declared a Coke Free Zone! "Pepsi, Coca-Cola, A&W and Jones - all a part of the same carbonated family? Not according to Killer Coke, a campaign that has reached the University of Maine. UMaine's 10-year contract with Coca-Cola will expire on June 30, 2009...The Campaign Against Killer Coke began in April 2003. The small organization spreads the message that Coca-Cola is involved in numerous unethical practices in several countries. The main goal is to encourage boycotts on Coca-Cola products." "Becoming water neutral is impossible, and Coca-Cola is very well aware of this. But matters like that have never stopped the company from making preposterous claims, however misleading and troublesome they may be. What is surprising, however, is the complete lack of scrutiny that Coca-Cola is subject to by the corporate social responsibility community and the media. Allowing Coca-Cola to get away with such a disingenuous plan significantly weakens the core aims of corporate social responsibility as well as objective reporting and makes CSR nothing more than an extension of public relations for companies." Watch "The Chloe Show-Killer Coke"
Watch the first Video from The Chloe Show. Chloe speaks about the Campaign to Stop Killer Coke at about 1:15 into this video. "Trade Union members were urged to choose Pepsi over Coca-Cola. "The Technical Engineering and Electrical Union said Coca-Cola's policies are anti-union and unethical, after it closed its Drogheda plant earlier this year with the loss of 250 jobs. "It wants its members to boycott the company's products. "TEEU spokesperson Arthur Hall said consumers need to use their power and think about how they spend their money." 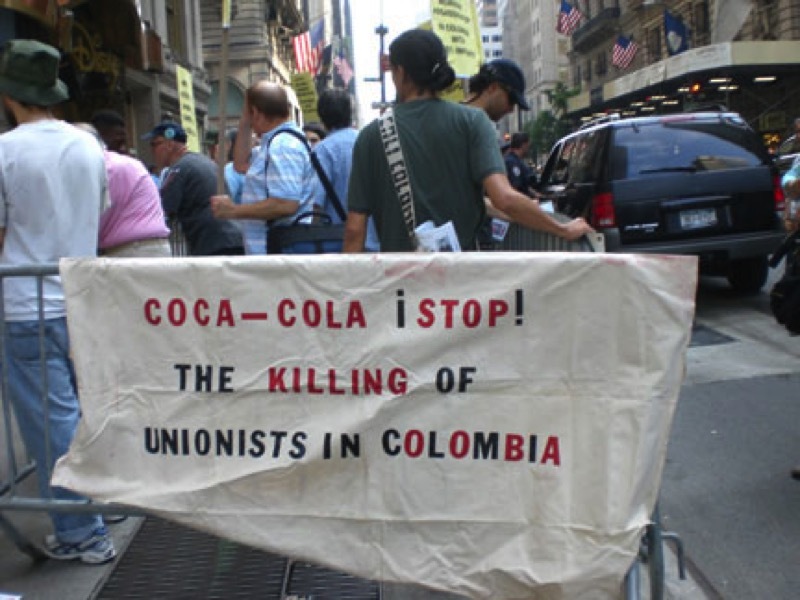 International Labor Organization, "Report Evaluation Mission Coca-Cola Bottling Plants in Colombia 30 June - 11 July 2008"
"...the Mission found that there appears to be a link between outsourcing and the fall in union membership and/or the fact that these workers do not organize. "One union representative (SINTRAINDEGA), from the Bogota South plant, said that "with the company's hiring system, the union is destined to disappear... In the space of one year we have lost 100 members." [Another union,] USITRAG, said: "The main problem is that very few have a direct relationship with the enterprise. This is due to the way in which the enterprise hires workers who provide certain services; the problem is the high incidence of subcontracting. Because of this workers are unable to organize and the future of the union is in danger." "The SINALTRAINAL representatives in the same plant agreed, observing that "Union membership has been decimated as a result of various ploys used by the enterprise such as the reinforcement of the accord [collective accords are agreements between employers and non-union workers]. All the unions are dwindling because the enterprise is standing in their way..."
The outsourcing of certain areas of the operation processes and, increasingly, of the production processes themselves, makes it difficult for the workers concerned to form or join unions..."
"The ILO report concluded that though Coca-Cola has enforced child labor laws and has encouraged equality and nondiscrimination in the workplace, not all of its workers have benefited. Since the company outsources many of its positions to subcontractors in Colombia, not all workers share the same rights as direct Coca-Cola employees." "The India Resource Center worked closely with Public Broadcasting Service (PBS) producers to highlight the critical campaign against Coca-Cola in Kala Dera in the state of Rajasthan. The story aired on NewsHour with Jim Lehrer on November 17, 2008 which has a daily viewership of 2.7 million in the US. While we think that the story missed some key points and could have been much stronger, we welcome the national attention nevertheless." "Reading all the stuff about aspartame could make your head explode. But what convinced me that aspartame is not safe are not just the studies that have found its link to cancer but also the efforts of Donald Rumsfield and Searle/Monsanto in ramming this product down our throats. Monsanto, as you know, is the world's leading producer of genetically modified products - another innovation that many are convinced has already wrought havoc on human life and the ecosystem - and uses not just money and influence but also threat and intimidation on those who go against it, as this Vanity Fair investigative report makes clear. Indeed, Monsanto's track record alone is enough to convince me that this product can kill me." "On Oct. 10, the Vassar Student Association (VSA) Council voted to support "replacing the sale of Coca-Cola products on campus with a viable alternative company (or companies)." 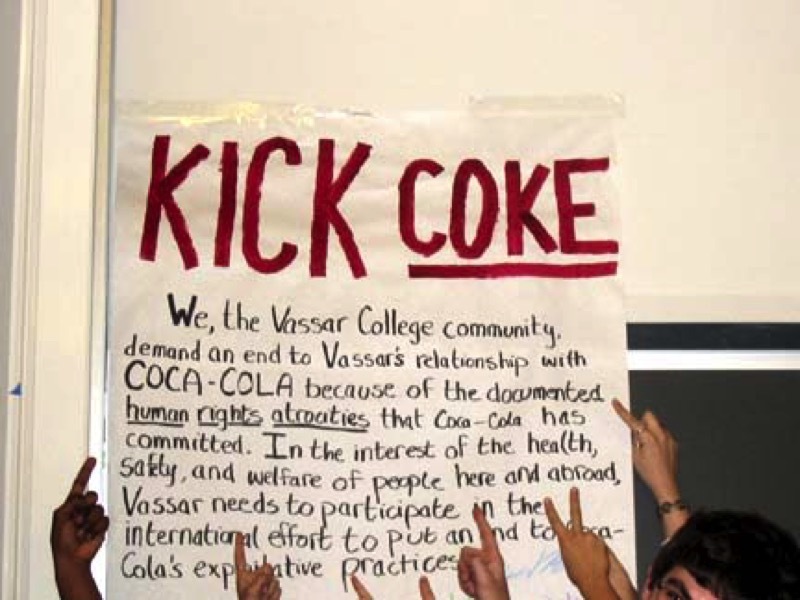 The resolution and the Vassar Kick Coke Campaign (a coalition of six VSA organizations) urge the administration to remove all Coca-Cola products from campus. A whopping 68 percent of students who responded to their VSA representatives' requests for feedback on the resolution supported kicking Coke." "At the Vassar Student Association (VSA) Council meeting on Nov. 2, Council passed the Kick Coke campaign's resolution by a vote of 14 to 8-only one vote above the majority required to pass..."
"Reed Dunlea '09, a member of the Kick Coke group, opened the discussion at Sunday's meeting, addressing some of the largest concerns raised about the campaign over the past week. Dunlea explained that the resolution, which states the VSA Council's support for removing Coke products from campus, was not a question of student choice. "This campaign is about the institution and community of Vassar College lending its support to people who've been negatively affected by Coke's practices," said Dunlea. He reminded the audience that even if Coca-Cola products are banned from campus, students can choose to purchase the products off-campus." This motion was presented at the October 30, 2008 Executive Board meeting. The motion was made, seconded and approved to support the boycott. Information explaining the reason for the boycott will be distributed to the membership of IBEW Local 2323 at union meetings. "I make a motion that IBEW Local 2323 will support the boycott of Coca Cola products that include Dasani, Fanta, Minute Maid, Nestea, Powerade and Sprite at our union meetings and events. "Additionally, we will support trade unionists in their efforts to represent Coke workers in Columbia and other locations worldwide." "The Coca-Cola company released its 2007/2008 Sustainability Review yesterday, and surprisingly, critical issues facing the company's operations in India do not find mention in the review. The Coca-Cola company gives itself high marks in its sustainability report which covers areas such as the workplace, environment and community engagement. However, the omission of the issues facing the company in India - various community campaigns accusing the company of creating water shortages and pollution - raise the question whether Coca-Cola's sustainability report is an attempt to manufacture a green image of itself rather than actually addressing the critical challenges facing the company's operations." "The outspoken Canadian activist tells Erin Anderssen that she will bring the same doggedness she displayed in opposing NAFTA and globalization to her new post as the UN's senior adviser on water issues. "...Ms. Barlow sat for two days in a small village with mothers who were holding a silent vigil to protest against a Coca-Cola plant that was siphoning off their water to bottle it. She was tear-gassed during an anti-globalization rally at the World Trade Organization meeting in Hong Kong in 2005." Matt Beard's new movie, "THE COST OF A COKE: 2ND EDITION" has been released. Click above or here to see the video.You can also go to Matt Beard's new website, www.BattleforJustice.com, to see this and other videos. Email Matt at justice.beard@gmail.com for info on how you can get a DVD with an Update on THE ILO's "INVESTIGATION" into the murders and corruption. "When I asked Coca-Cola about these talks, it portrayed them as 'fruitful and informative'. The purpose of the talks, the company said, was 'to assess whether a mediated resolution of the parties' differences could be achieved'. In short, it was looking to settle out of court, and with a settlement such as this comes money - a lot of money. How much? A barrowful. Although I cannot disclose the exact sum offered to Sinaltrainal and the plaintiffs in the lawsuit, it is my understanding that it had six noughts at the end of a dollar sign and a couple of digits in between. The negotiations broke down in early 2008. Coca-Cola said 'no final resolution was possible. An impasse was reached and no further discussions are anticipated at this time.' Arguably, the impasse was a result of the conditions of the settlement: Coke would pay millions of dollars, but anyone working for Coca-Cola Femsa and involved in the lawsuit had to leave their jobs - they could no longer work for Coke's contractors. But more than this, they would be legally bound never to criticise Coca-Cola again. According to Paez, this would apply 'not only in Colombia but everywhere in the whole world. They wanted us to sign an agreement that no one would denounce Coca-Cola any more, for the rest of their lives.' In effect, the agreement, if signed, would prevent them from campaigning against any multinational that Coca-Cola had business with. From the moment they signed until the day they died." "Dispatches: Mark Thomas on Coca-Cola"
"As a child, Mark Thomas adored Coca-Cola. He'd drink it whenever he visited his much-loved nan - a warm family image that would doubtless play nicely with the company's brand managers. 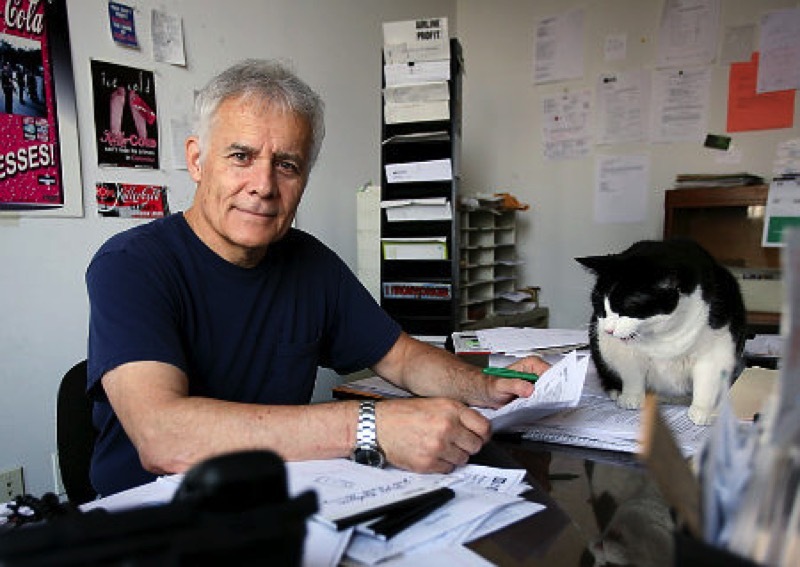 "A few decades on, and this formidable comic campaigner continues to unravel claims, first highlighted in his Dispatches programme for Channel 4 last year, of the company's alleged corporate irresponsibility regarding the behaviour of those employed within its complicated web of franchisees and distribution deals. "After a nauseatingly saccharine experience at the Coca-Cola Museum in Atlanta, he uncovers many fascinating case studies: in Colombia, union members claim they have been badly treated by bottling facility managers; in India, Coca-Cola factories are using so much water the land is sucked dry. "What emerges is a disheartening and frustrating tale of a company seemingly trying to extricate itself from being ethically liable for those who work under what it calls 'the Coca-Cola system'. "Thomas is effortlessly funny and vivid in his description of every furrowed unionist brow and makeshift protest shelter. The company mostly stonewalls his efforts to make it redress the balance but Thomas's study isn't in vain: if this book doesn't make you boycott The Coke Side Of Life, few things will." "POLITICAL activist, comedian and writer, Mark Thomas, provides one of the standout attractions of the Guildford Book Festival when he arrives to give an insight into his latest work, Belching Out The Devil...Focusing on the workers and events that are not part of the company's multimillion-dollar advertising campaigns, he exposes a series of provocative tales." 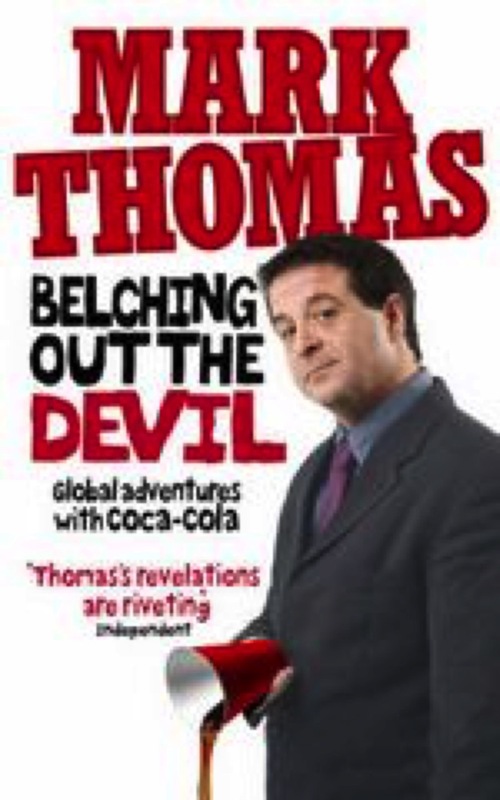 "Both cheeky comic and committed campaigner, Mark Thomas is on the case of Coca-Cola in his new book, 'Belching Out The Devil', which takes the company to task with accusations of human rights abuses." India Resource Center, Review of "Belching Out the Devil: Global Adventures with Coca-Cola"
"Vitamin and sports water drinks are so laden with sugar and caffeine that claims about their health-giving benefits should be taken with a grain of salt, nutritionists have warned. "Consumer advocate group Choice says an unwitting public is being deliberately misled about the health benefits of enhanced water drinks, with some 500-millilitre varieties containing eight teaspoons of sugar, high levels of caffeine and a host of additives, including flavours and colours. While it purported to be a healthy beverage, a 575-millilitre bottle of Nutrient Water contained seven teaspoons of sugar, she said, and Smart Water's 500-millilitre bottle had eight teaspoons. A 375-millilitre can of Coca-Cola contains 10 teaspoons of sugar." Maude Barlow, head of the Council of Canadians, Canada's largest public advocacy organization, and founder of the Blue Planet Project. She is the author of sixteen books, including Blue Gold. Her latest is Blue Covenant: The Global Water Crisis and the Coming Battle for the Right to Water. She is a recipient of Sweden's Right Livelihood Award, known as the "Alternative Nobel." Irena Salina, award-winning filmmaker. She is the director of FLOW. Click here to go to the film's website. "A documentary and a three-alarm warning, "Flow" dives into our planet's most essential resource - and third- largest industry - to find pollution, scarcity, human suffering and corporate profit. And that's just in the United States." There is a segment in the film highlighting the demonstrations at the Coke bottling plant in Plachimada, India. These demonstrations led to the closing of the plant.
" It is said that those who don't learn from the mistakes of the past are destined to repeat them. It seems that the Coca-Cola has not learnt any lessons from its past mistakes in India. The manner is which the Coca-Cola company has decided to deal with another formidable community-led campaign in India — in the village of Kala Dera in the state of Rajasthan — is indicative of the arrogance and impunity of the company that has landed it in trouble before. And Coca- Cola in India is in for a rude awakening, once again." "Bottled water, of course, doesn't cost $4 a gallon. It costs $5.76 a gallon (for a bottle of Dasani, at 4.5 cents per fluid ounce). The same amount of Fiji ("Every drop is green") will set you back $7.55. Celebrity-endorsed, electrolyte- enhanced Smartwater ('the water with all the answers') is $6.14. Arrowhead, in an 'Eco-Shape' bottle, is a relative bargain, at $4.48 per gallon." The Cost of a Coke: 2nd Edition Coming Soon! "The insider said that soon after the interview, Coca Cola called the Dacheng Law, demanding Qian withdraw his comments, adding pointedly that Coca Cola employed many of Dacheng's lawyers as counselors. 'Which is more important, just think it over!' was the gist of Coca Cola's message - according to the source. A few hours later, Qian announced that he had withdrawn his comments." 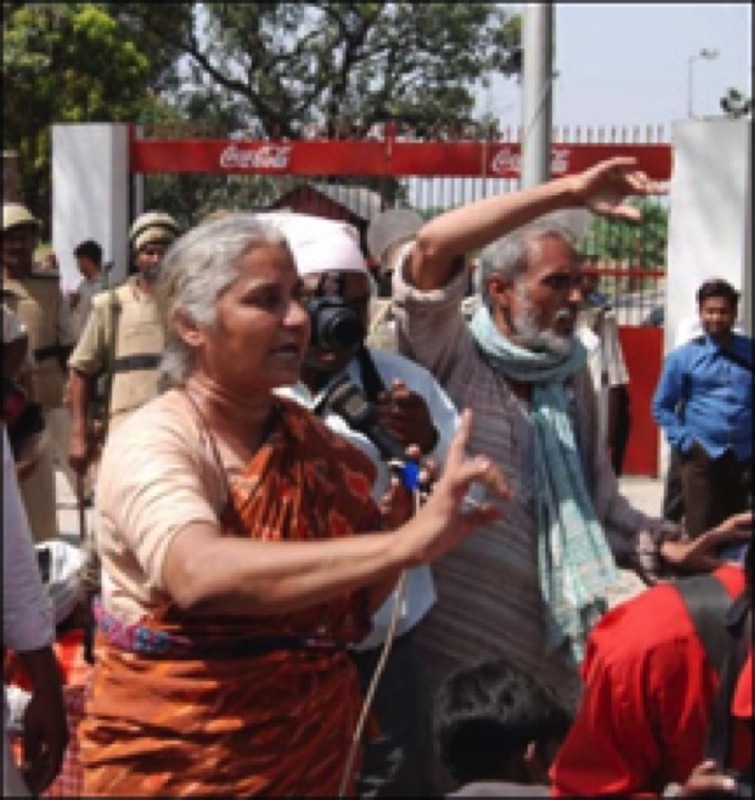 "Residents living around Coca-Cola's bottling plant in Kala Dera, near Jaipur in Rajasthan, India marched and rallied yesterday demanding the closure of the bottling plant. Nearly 60 villages surrounding Coca-Cola's bottling plant in Kala Dera have complained of severe water shortages since the bottling plant began operations in the area. " Article corrections: 1. In discussing the campaign to win a TWU Local 100 contract in 1999, there was no strike. The article should have stated: "The contract was settled shortly afterward." 2. TIAA-CREF has divested itself of more than one and a quarter million shares of Coca-Cola stock, not a quarter million. "The volunteers who run the Cube Microplex, a popular alternative film venue, don't agree on everything. But there's one issue that has total support: the anti-Coca-Cola movement. Opposed to Coca-Cola for what they regard as the company's 'dodgy' business and environmental practices, the operators of the Cube have never served Coke." "'Community campaigns in India have shut down Coca-Cola bottling plants in Plachimada and in Balia, and now we will ensure that Coca-Cola bottling plants in Mehdiganj and Kala Dera also meet the same fate,' said Nandlal Master of Lok Samiti, a community group challenging Coca-Cola's operations in Mehdiganj, near Varanasi. Lok Samiti worked very closely with the community in Sinhachawar towards the plant's closure. The Coca-Cola company is also the target of intense community campaigns in Mehdiganj and Kala Dera in India for creating water shortages and pollution. The company was forced to agree to an assessment of its bottling operations in India as a result of a sustained international campaign. The assessment, released in January 2008, was a damning indictment of Coca-Cola's water management practices in India. 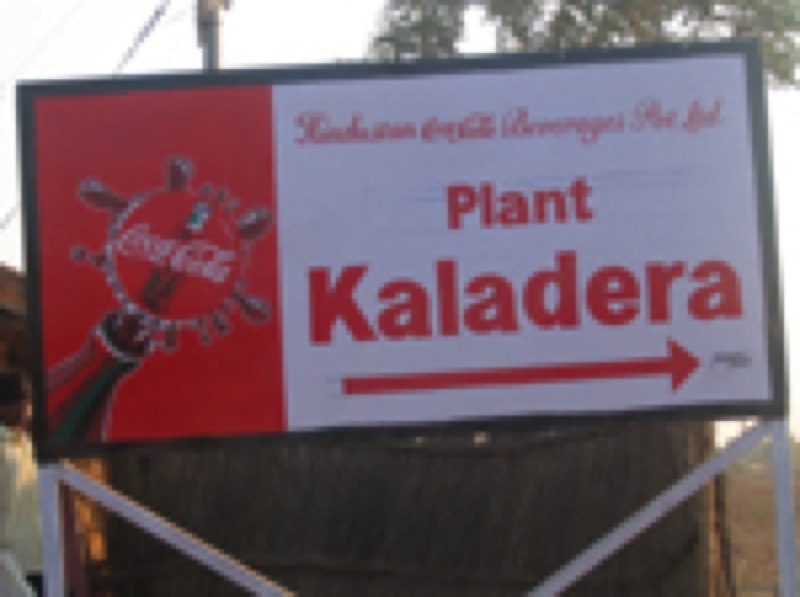 The assessment recommends that Coca-Cola shut down its bottling plant in Kala Dera because the plant contributes significantly to water shortages in the area. "We are requesting that locals contact their employers and request that Coca-Cola products be kept out of the workplaces and work meetings." "The council of Colombian capital Bogota fined the local unit of Mexico-based soft-drink bottler Coca-Cola Femsa SA (KOF) 201 million Colombian pesos, or about $110,000, for dumping industrial waste waters in marshes located in the city's outskirts...The council's environment secretary's office said Femsa had been polluting the wetlands with industrial waste waters since 2006." "It's been called the "Grocery Shrink Ray" — this is the phenomenon that marketers are becoming more and more enamored with that sees the size of packaging (and the actual product inside) reduced while the price remains unchanged...It's been estimated that Coca-Cola will shortly begin shrinking their cans -- they've already begun in Hong Kong — from 355 millilitres to 330." "If you are planning to either go to the Olympic Games in China, or plan on watching them on Television. You should bear in mind that the image that China is presenting to the world is a false one. The vast majority of its 1.2 billion citizens live in poverty, but by far the worst excesses of the regime in Beijing are that China executes more people than any other country on earth. Often for crimes that are not considered crimes in other countries, or at the most would carry a light sentence. "Worried that your consumer dollars are rewarding bad corporations with problem practices? Concerned about greenwashing? Wish there was an easy way to get the dirt on America's biggest companies before you buy something? Looking for a way to pressure consumer companies you patronize to get responsible and clean up their acts? For concerned consumers, the answer to those questions is the newly expanded ResponsibleShopper.org Web site (http://www.Responsibleshopper.org) operated by Co-op America. The expanded Responsible Shopper site relaunched at 1:30 p.m. EDT today (July 30, 2008)." "-- Coca-Cola: Coke's food and beverages are enjoyed by millions of people around the world. But the beverage giant has had adverse effects on millions more. In India, Coke was found to have pumped hazardous waste into farms fields and a local canal that flows into the Ganges. A study by an Indian organization found high levels of pesticides in all of the Coke products that it tested, 27 times higher than what is allowed under Indian regulations. Elsewhere, Coke has been accused of human rights violations in several countries, discrimination against women and minorities in its US bottling plants, union busting, and underwent an investigation by the Securities and Exchange Commission (SEC) for allegedly committing $2 billion in accounting fraud." The Campaign to Stop Killer COke has had a link to The Responsible Shopper for a few years. When we receive emails or calls asking us about the record of Coke and other beverage companies, we have long referred people to this site. The newly expanded site not only rates these corporations, but links one to organizations like our Campaign that demand accountability from these corporations. On April 16, the Campaign to Stop Killer Coke, Polaris Institute, Corporate Accountability International, India Resource Center, Coke large shareholder B. Wardlaw, Mark Thomas, Students for a Free Tibet, students and others went to Wilmington, Delaware, to confront the Coke policymakers with their crimes against humanity. The Polaris Institute, Canada, filmed participants answering the question, "What do you want to say to Coke?" This protest was in support of the Multinational Tribunal taking place on July 21, 22 and 23 in Colombia concerning the Crimes Against Humanity committed by transnational corporations in different sectors of the economy. "It's day six of a strike involving Coca Cola Bottlers. We found union employees picketing this morning in Tillman's Corner. They are protesting Coca Cola's plan to take away their pensions. Employees say the move from pension plans to 401-k would cost some of them thousands of dollars.. Teamsters are also on the picket lines in Robertsdale, Leroy and Vancleave, Mississippi. 270 union workers are being affected by the pension plan change." "'What the company wants is to stop paying into the pension plan,' said Gookins in a phone interview. 'The contributions have not increased since 1990, at $69 per week. The federal government told them to increase that to about 8 percent...' Steele added striking workers will be expected to contribute an average of $1155 per month to continue their health plans under 'COBRA,' the Consolidated Omnibus Budget Reconciliation Act." "Drinkers of Coca-Cola can expect to pay more starting this fall after Coca-Cola Enterprises, the company's biggest bottler, said Thursday that it would raise prices. Problems at the bottler also hurt the Coca-Cola Company's bottom line, because it owns about 35 percent of that business. Coke said Thursday that its profit fell 23 percent in the second quarter, when it took a charge because of the bottler's woes." "The bottler will increase U.S. prices after the Labor Day holiday, Brock said. 'North America is just a tremendous problem,' Tom Pirko, the president of Bevmark LLC, a consulting firm in Buellton, California, said in a Bloomberg Television interview." "The taste of the milk is totally dependent on the health of the cow. Coca-Cola had a tough second quarter after its largest bottler Coca-Cola Enterprises [CCE] took a huge hit and came out with a loss. Coca-Cola Enterprises, one of 74 Coke bottlers in the U.S., wrote-down $5.3 billion related to a franchise impairment charge and lost $3.2 billion, or $6.52 per share, in the second quarter causing its share to drop 0.6%, or 10 cents, to $16.74 in afternoon trading on Thursday. Coca-Cola Enterprises accounts for 80% of Coca-Cola's U.S. market." "One critic was Neil Wollman, a senior fellow at Bentley College in Massachusetts who has been needling TIAA- CREF since 1984. Wollman and colleagues are upset about labor practices at Nike, Coca-Cola, and Wal-Mart and want TIAA-CREF, which manages $420 billion in assets, to hold those companies and others accountable." "If parents were to blame, why did the obesity crisis happen now instead of decades ago? The answer is because parental authority is usurped by food marketers in every opportunity they get...At the same time, school funding has declined in the last several decades and schools have reduced their physical education programs, ripped out their kitchens, and fired the lunch ladies. Companies like Coca-Cola and Pepsi prey on poorly-funded schools, offering incentives if they sell more soda." "...A similar attempt to preserve the integrity of Coca-Cola within the soft-drinks market was made in 2007 advertisements [Satire of ad] that linked the company directly to Martin Luther King Jr. in a celebration of Black history. The campaign failed to mention his call for a boycott of Coca-Cola during the Civil Rights Movement following the discrimination of Black employees. Coca-Cola's tendency towards racial discrimination can also be observed in its alleged support of the 1936 Berlin Olympics and the advertisements placed in Hitler Youth booklets. Furthermore in 2001, Coca-Cola had to pay the largest racial discrimination settlement in US history of $192.5 million - a huge contradiction for a company that boasts of its " long-standing commitment to equal opportunity and intolerance of discrimination. "Perhaps after reading thus far into the dark side of Coca-Cola, it may no longer shock you that this reputable company has long been practicing anti-worker and anti-environmental policies worldwide. The UK's Channel 4 Production, "Dispatches: Mark Thomas on Coca-Cola" of 2007, exposed child labour in El Salvador sugar fields. During sugar harvesting, the young workers suffer from smoke inhalation, burns and cuts from machetes yet have no access to healthcare. Despite this, Coca-Cola continues to spend $3 billion a year on advertising and claims to firmly oppose child labour." "Nearly 80 workers in the Dallas office of soda bottler Coca-Cola Enterprises Inc. will probably see their jobs shipped overseas at year's end, the company said Friday." "Atlanta-based Coca-Cola Co. has imposed a hiring freeze for most of its North American business unit, a part of Coke that has struggled to grow profits and volume...An additional 150 jobs could be lost in the Tampa, Fla., area and 70 workers could be furloughed in Toronto, the company said." "When we drink water, what's the real message in the bottle? Activists, governments and the bottled-water industry have engaged in a giant water fight for the past two years, extensively reported by the media. By now, many consumers know that the mass marketing of water in single-use bottles has environmental consequences, and that some reusable water bottles may pose health risks." "Measured in 700-milliliter bottles of Poland Spring, a daily intake of water would cost $4.41, based on prices at a CVS drugstore in New York. Or $6.36 in 20-ounce bottles of Dasani. By half-liters of Evian, that'll be $6.76, please. Which adds up to thousands a year. Even a 24-pack of half-liter bottles at Costco, a bargain at $6.97, would be consumed by one person in six days. That's more than $400 a year. But water from the tap? A little more than 0.001 cent for a day's worth of water, based on averages from an American Water Works Association survey - just about 51 cents a year. "Coca-Cola Enterprises, the biggest bottler of Coca-Cola's Dasani, recently cut its outlook for the quarter; it said the weak North American economy is hurting sales of bottled water and soda - especially the 20-ounce single-serving sizes consumers had been buying at gas stations." "Coca-Cola Co has agreed to pay US$137.5 million to settle a lawsuit in which it was accused of with-holding information to increase its stock price...Plaintiffs said bottlers in Japan were forced to buy extra syrup in an effort to inflate sales - called channel stuffing - so that Coca-Cola could post higher income and therefore artificially boost its share price." Please send this press release to any contacts you may have in the Obama campaign or the Democratic Party. "Sam Nunn sits on the boards of four of the most abusive corporations in the world - The Coca-Cola Co., Chevron, General Electric and Dell Computers. All four have shown scant regard for human rights, the environment and/or the labor movement of the countries in which they operate. Yet Nunn has been silent about the abuses of his corporate bedfellows and, of course, is very well compensated as a board member." "Could The Democrats Seriously Run Obama-Nunn? "Democrats on Capitol Hill are mentioning that they're hearing from the Obama campaign that former Georgia Senator Sam Nunn is on the list to be Obama's running mate. "Perhaps Nunn could renounce all of his previous positions. But if he didn't, would the Democratic base be comfortable with a potential vice president who opposed Bill Clinton's plan to raise taxes, opposed gays in the military, supports school prayer, supports a balanced budget amendment, voted against prohibiting job discrimination by sexual orientation, voted in favor of abstinence education, opposed requirements for ethanol in gasoline, supports a Constitutional Amendment to prohibit flag burning, supports limits on death penalty appeals, limits on punitive damage awards, voted to overturn Bill Clinton's veto of the partial-birth abortion ban in 1996, once supported a Constitutional amendment to ban abortion, supported capital gains tax cuts as long as they were coupled to deficit-reducing measures, was once a member of a restricted country club, and was a member of the centrist Democratic Leadership Council? "And who would, at age 70, pretty much take the "age" card away from the Democrats? "How odd would it be to have a ticket of a man who ran his first political race in 1996, and a man who ran his last political race in 1990? "I like Sam Nunn. But how many liberals would be slack-jawed at the thought of a running mate who had spent most of his legislative career voting against the ideas that make up the Obama vision?..." "[Trustee Stepan] Vdovine, who has long been opposed to vending machines in schools, asked for a copy of the district's contract with Coca-Cola, but was told he couldn't have it because it was confidential...School districts and municipalities across Canada have already moved to ban the sale of bottled water from their schools." Stony Brook University, State University of New York, removes Coke products from campus signing a 10-year contract with Pepsi. "Subject: Stony Brook University is pleased to announce a ten year partnership with Pepsi for the exclusive beverage pouring rights at the University. "Stony Brook University is pleased to announce a ten year partnership with Pepsi for the exclusive beverage pouring rights at the University. This agreement will provide the campus with an exciting variety of beverages as well as significant support for student scholarships. "The awarding of this contract was the result of an extensive, formal bidding process that included a committee of campus professional staff, undergraduate and graduate students. Pepsi's bid was rated highest in a variety of criteria that included both financial return and other important issues to the University and the campus community." Congratulations to the Social Justice Alliance, students and faculty of SUNY Stony Brook for a hard-fought campaign and victory. 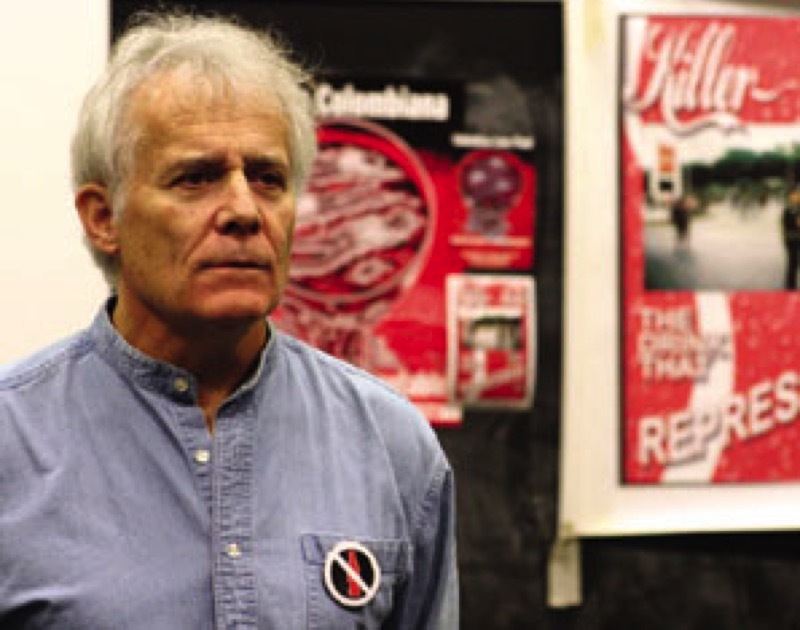 "The Social Justice Alliance (SJA) started the Coca-Cola Campaign on Stony Brook Campus in Fall of 2005, where they began educating students on the corporation's human rights abuses with SINALTRAINAL, a union in Colombia. They delivered letters to the Administration, informing them of the abuses and started holding panels and discussion forums to gain the support of the student body. "...BE IT RESOLVED that the UUP Delegate Assembly recommends to the statewide UUP Executive Board that UUP not serve Coca-Cola products at its events, meetings, conferences, and delegate assemblies,"
Press Release from SUNY Albany, "The SUNY-Wide Campaign To Hold Coca-Cola Accountable: SUNY Stony Brook Passes The Test On Human Rights; SUNY Albany Fails!" 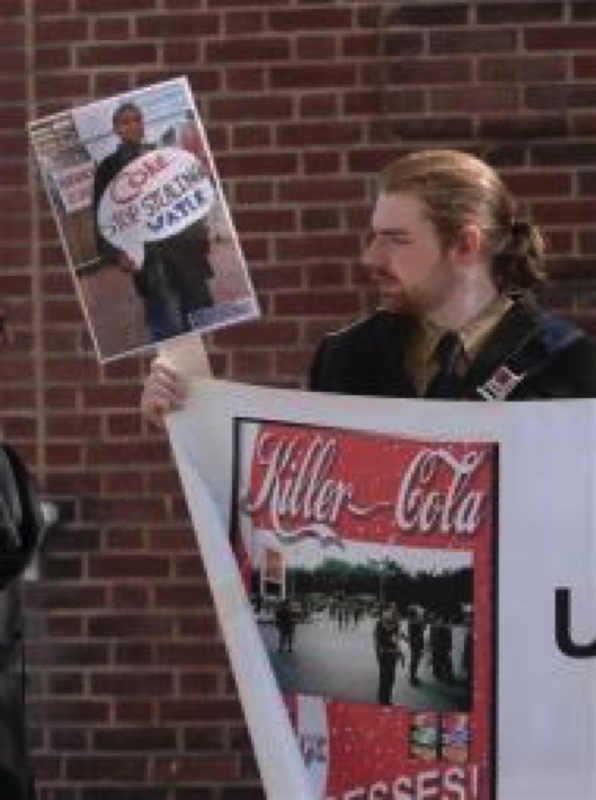 "Kurt Amelang, a member of Students for Workers' Rights stated, 'SUNY Stony Brook's initiative on the Coca-Cola issue demonstrates their commitment to human rights. SUNY Albany, on the other hand, has failed workers in Colombia, farmers in India, and the students, faculty and community members who want human rights to be a deciding factor in doing good business.' "
It should be noted, although not mentioned in the article, that Coke also does business in Sudan. Read Point 10 in our Talking Points. "Miami's Mayor Manny Diaz is among more than a dozen mayors calling on municipal governments to phase out bottled-water purchases in a resolution to be presented at the U.S. Mayors Conference, which begins Friday in Miami. "City Commissioner Marc Sarnoff, who pushed for the City Hall ban — which he says could save the city as much as $200,000 a year — joined the tap movement because of concerns about litter. He said 85 percent of bottles are not recycled, and contribute to clogging in Miami's sewer systems. He attributed current flooding in Brickell and the Venetian Islands to sewer systems stuffed with the plastic containers. He also pointed out that it takes petroleum to make the bottles, holding up a plastic bottle filled with dark liquid. He said almost a quarter of the liquid represented the oil needed to produce and transport the bottle." Star Tribune, "Rybak, U.S. mayors: Reach for tap, not the bottle," By Paul Walsh, June 21, 2008. "Distributors of bottled water, including Coca-Cola and Pepsi, oppose the campaign. Last year, Coca-Cola and the association passed out fliers at the Conference of Mayors that argued against a resolution to study the impact of bottled water on municipal waste." "The movement, however, has raised concern in the beverage industry. Coca-Cola, Pepsi and the American Beverage Association have all increased their lobbying against it. Last year, Coca-Cola and the association passed out fliers at the Conference of Mayors that argued against a resolution, introduced by Mayor Newsom, to study the impact of bottled water on municipal waste..."
Summary: Advancing the legal efforts began with the United Steelworkers Union in 2001, IRAdvocates is working to hold Coca-Cola accountable for the murder and torture of trade union leaders in Colombia. 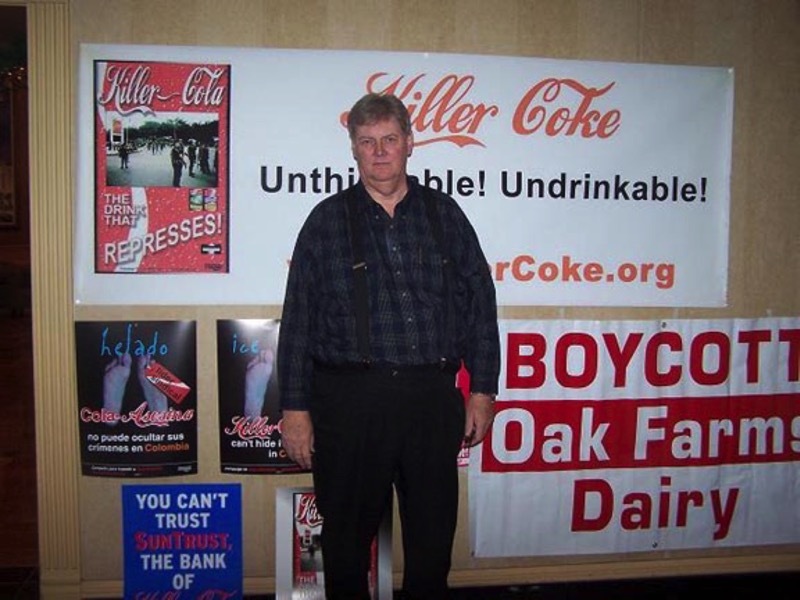 This case also pioneered the use of a focused corporate campaign tied to the demands made by the Plaintiffs (see www.Killercoke.org). The case is currently pending in the 11th Circuit, and the parties have been in protracted discussions in an effort to resolve the issues. Case Name: TURIDI et al. v. THE COCA-COLA COMPANY et al. Summary: In 2005, 105 workers at a Coca-Cola bottling plant in Istanbul Turkey joined a union and were terminated. They organized a lengthy sit-down strike in front of the main offices of Coca-Cola in Turkey. After several weeks of protesting, the workers entered the building to demand their reinstatement. While leaders of the workers were meeting with senior management for the company, the company ordered Turkish riot police to attack the workers who were by all accounts peacefully assembled, many with their spouses and children. Nearly two hundred of them were beaten badly and many required hospitalization. The victims sued for torture under the ATCA, as well as battery, assault, emotional distress under New York state law. They also brought claims for unfair business practices because Coca-Cola has been representing to the public that they are not an anti-union company and they require their bottlers to respect fundamental worker rights. The case was initially dismissed on forum non conveniens grounds, with the Court ordering the case transferred to Turkey. Plaintiffs instead appealed to the Second Circuit Court of Appeals, where the case is pending. The case is currently pending in the 11th Circuit, and the parties have been in protracted discussions in an effort to resolve the issues. "In this instant the contradiction between corporate social responsibility and greenwashing floated to the surface of the rarified air of a packed Hotel Dupont ballroom. When guaranteeing a profitable return to shareholders depends on exploiting and controlling resources and troubling social phenomena, rhetoric about sustainability rings hollow and self serving." This was part of a theatre project for Ohio State's 610 Directing Class, the commercials were used as part of a live performance calling attention to how Coca Cola does business around the world. "Free Schools (or Free Skools, as sometimes known) generally reject the commoditization of knowledge and have a bit of a radical bent. Hence Killer Coke Campaign: 'Learn about the evils of the Coca-Cola Co. and how we as community members and students can stop its influence in the world around us and the university.' "
"The Bigger Better Bottle Bill, which would have expanded five-cent refundable deposits on beverage containers to water bottles and other non-carbonated beverages, was not included in the finalized state budget put out on Apr. 9 despite student activists' lobbying efforts...Bigger Better Bottle Bill opponents include the Coca-Cola Company, PepsiCo., Anheuser Busch, grocers and even some liquor store owners. The opposition is largely in response to the possibility of higher operating costs if the bill was included in the budget." "For just under a year, NYU has been selling the Coca-Cola product VitaminWater in dining halls and cafeterias, going against its own Coke product ban which has been in effect since December 2005. Glaceau, the company that produces VitaminWater, was purchased by Coke in May 2007. After an inquiry from WSN, university spokesman John Beckman responded by saying that the university would have VitaminWater off the shelves by the start of the summer term." "A documentary by a group of anthropology students about our society's attempt to replace Coke Products in our student union outlets." "Traditionally, those protesting the Games have targeted the host country or the International Olympic Committee, but nongovernmental organizations with increasingly sophisticated networks are now zeroing in more on corporate sponsors. Coca-Cola is particularly vulnerable because it sponsors both the Beijing Games as well as the contentious Olympic torch relay, which is scheduled to hit Chinese shores in a few days time. Already, protests have forced the company to cancel plans to sponsor a float in Japan, as the WSJ reported recently. The company was also publicly snubbed when some of its painstakingly selected torchbearers publicly turned down the honor, most notably Nobel laureate Wangari Maathai." "Persistent disruption to the Olympic torch relay has been followed by an open letter in which 150 activist groups claimed that sponsor, Coca-Cola, will be 'complicit in a humanitarian disaster in Tibet' if it fails to force the International Olympics Committee to direct the relay away from the territory." Coca-Cola Enterprises Inc. said workers at two of its production facilities in France went on strike on April 17 over the negotiation of labor agreements...The largest bottler of Coca-Cola Co. (KO) drinks Thursday reported a 47% drop in first-quarter net income, citing a soft economy in North America and higher commodities costs." It should be noted that Coca-Cola Enterprises is losing tens of millions in revenues from lost contracts at colleges, universities, high schools and elsewhere in the U.S., Canada and Europe as a result of the campaigns to stop Killer Coke. "Until then, we would encourage all torchbearers to cease being ambassadors for a company that is blind to everything except profits. And encourage consumers to think before they drink Coca-Cola." "This is a crisis decades in the making. And when Coca-Cola syrup can be imported to a trade-embargoed, food-starved country under rules governing humanitarian aid, clearly the world's wealthiest nations need to rethink how they manage the world's food supply. As it stands now, the planet has become a powder keg, as starving people the world over panic over higher prices. Perhaps this is the crisis that will persuade the international community to rethink agriculture, trade rules and the way we administer foreign aid." "Coke's request that NYU lift the ban demonstrates that the ban applies pressure on Coke to change." 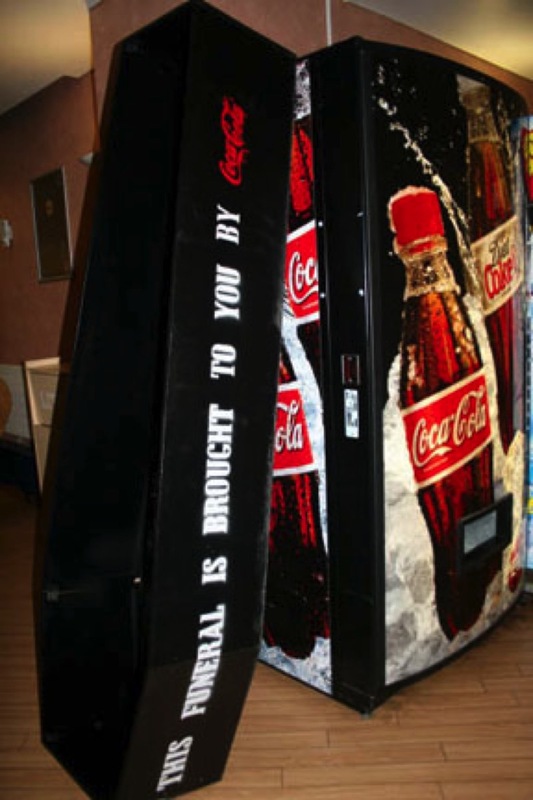 "While it is true that products produced and bottled in other countries stay within their own borders and are not being sold in the United States, accepting funding from a company [Coca-Cola] that so blatantly violates human rights and shows such an uncouth attitude towards the general populations affected by its factories seems counterintuitive to the socially progressive message of UMM [University of Minnesota, Morris]." "Activists believe their protests are having an effect. The torch relay's angry reception has discomforted sponsors Coca-Cola, Lenovo and Samsung. Last week, Human Rights Watch accused 'cowardly' partners of remaining 'largely silent' in the face of abuses...Robert Gooden, Amnesty's Asia-Pacific campaign co-ordinator, said. 'Corporations do have influence, and we would call on them to exert it publicly.' 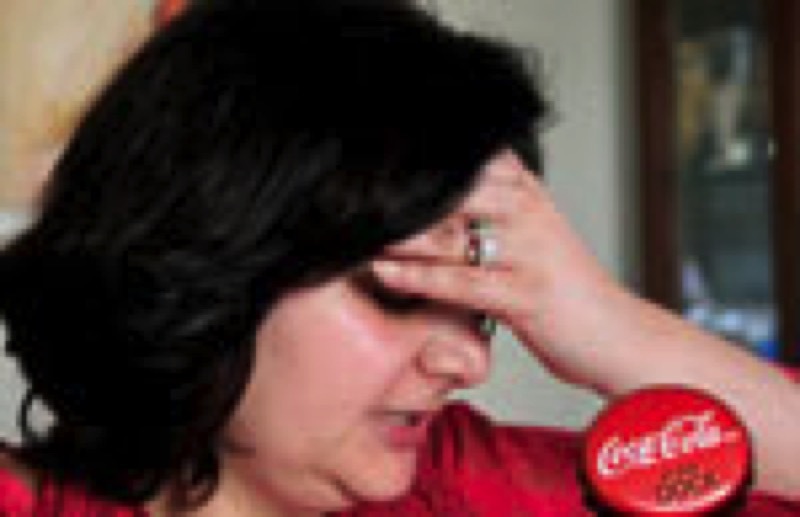 "
"This is the gut-wrenching and sickening story of how The Coca-Cola Company - Atlanta and Coke India have refused to give justice to Payal Chawla Singh, who was once their Senior Legal Counsel despite documentary evidence that her seniors have harassed, discriminated and retaliated against her in the most petty, malicious and outrageous manner." "We won, even when we were told we wouldn't. We won. OPSEU, as I have been told, is now the first Canadian union to officially call for the complete boycott of Coca-Cola and their subsidiaries and an all out ban of their products at any functions. We will also go after free trade agreements and unionized hotels that we deal with to stop carrying Coca-Cola. "We also had a worker who is now a member of OPSEU who works as a paramedic and who is from Colombia. He was tortured by paramilitaries and he spoke against Coca-Cola just before the resolution. "In the end, with 1600 people in the room and 851 voting delegates, only a handful voted against. It passed with flying colours. We won and now the struggle continues. Hopefully, other Canadian locals will get on board. This was a big victory for us at OPSEU." "But supporters of the ban have criticized the ILO's investigation, questioning its neutrality and efficacy. Specifically, they have accused the organization of having a conflict of interest, because Ed Potter, Coca-Cola's director of global relations, is also a long-time member of the ILO...Senators also criticized the investigation's speed. It was originally announced in early 2006, spurring the University of Michigan to revoke its own Coca-Cola ban. But last year, the Michigan Daily reported that the ILO had fallen behind on all of its deadlines for the investigation." Read more about the ILO "investigation" in Point 7 of the Campaign's "10 Critical Talking Points." "...[W]hile doing research in Colombia in 2003, I had the opportunity to meet many Coke workers and their families. They were exceptionally courageous; many lived under constant bodyguard. I became friendly with a Coke union activist named Efrain Guerrero. Shortly after I left, his brother-in-law and nephew were machine-gunned in their living room, killed to intimidate Efrain. Coke, his employer, should be held accountable for crimes like these. So far, it has not been." "We believe the university should not repeal the ban - as symbolic or as small as it may seem, it sends a message that NYU will not support a company with dirty labor practices." "With musical acts and signs, a group of Clark University students drew attention to the center of campus Wednesday hoping to get their message across. The group, called Campus Accountability Now, is against the distribution of Coca-Cola products, accusing the company of human rights abuses." Cardiff University, UK, "This Funeral Is Brought To You By Coca Cola"
"Here are some photos of the "This Funeral Is Brought To You By Coca Cola" demo which we had on Wednesday 16th April at Cardiff University [UK] as part of our Kick Killer Coke Off Campus campaign. 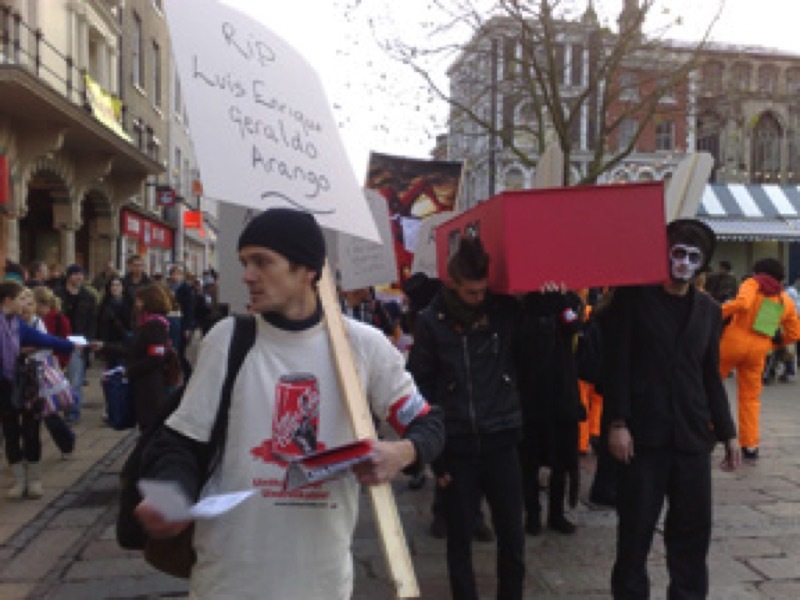 We marched through the main university building, complete with a purpose built coffin, sprayed up with the slogan and tombstones to represent the trade union members who were killed in Colombia. We congregated outside the student union where flyers were handed out — there were a number of interesting discussions with students who pledged their support, but also their ignorance of Coke's crimes. We had around 50 people attend and students taking photos and a film — which I will send on when its been cut. We also had the student union President and Vice President come out to speak to us about our campaign. The Cardiff AGM is in February 2009, which we are building towards. We also intend to replace Coke with Ubuntu. Read the Campaign to Stop Killer Coke on "Coca-Cola, Darfur, Tibet & the China Olympics"
Video, "Is this the Coke Side of Life?" Click here to see "Is this the Coke Side of Life?" " '"We're not asking Coke to solve Tibet's problems,' Lhadon Tethong, the director of an organizing group called Students for a Free Tibet, told Mr. Isdell at the shareholder meeting on Wednesday. '"We're not asking you to do anything else but tell the I.O.C. this is not the time for the torch to go to Tibet.' Ms. Tethong added, '"You have influence, and you know you have influence. Please don't hide behind a spin.' "
"At Coke's annual meeting, Isdell was interrupted several times by shareholders who questioned the company's business practices in India and Colombia. The company has been accused of depleting water resources in India and not protecting workers in Colombia. Coke has denied the allegations." "Outgoing company chairman and chief executive Neville Isdell kept tight control over attempts by several angry shareholders to continue speaking when their time ran out. But he was unable to stop an outburst by Lebsang Choepal who said he had been born in Tibet, lost a brother and brother-in-law who were allegedly killed by the Chinese government for seeking independence for Tibet. A recent crackdown in Tibet by Beijing has fueled worldwide anger and led to protests during the global relay of the Olympic torch with India bracing for anti-China protests when the flame reaches New Delhi on Thursday. Kumar urged Isdell to support a shareholder proposal calling for a special board committee to review human rights violations by Beijing." "The Coca-Cola Co. believes the torch relay should continue as part of the run-up to the Summer Olympics in Beijing and it stands by its sponsorship of the event, chief executive Neville Isdell told shareholders Wednesday. Amid concerns about China's human rights record, the torch relay has been disrupted in Greece, Istanbul, London and Paris by protesters opposed to Chinese policies in Tibet. Atlanta-based Coca-Cola is a corporate sponsor of the torch relay." "It wants Coke to push Olympic officials to alter the torch route so it does not go through Tibet, on its way to Beijing. If the torch goes through Tibet, it will cause more violence, she said. 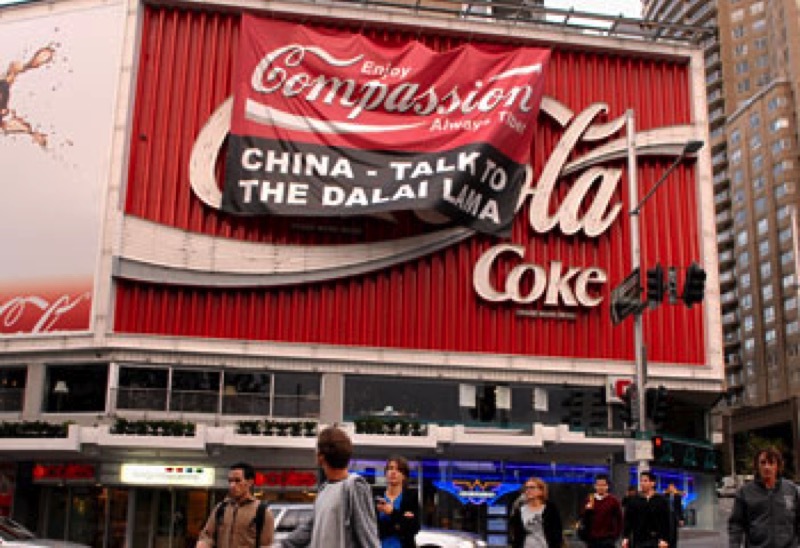 '"Coke will be underwriting bloodshed in Tibet,' Tethong said. 'This is not the time for the torch to go through Tibet.' "
"Coke has also refused to inform consumers of the source of its Dasani bottled water, even as market leader Aquafina (Pepsi) has agreed to do so. To add salt to the wound, Coke has also continued to drain water in drought prone areas from the southeast United States to India, in spite of community concerns." Luis Adolfo Cardona was witness to the paramilitary death squad murder of Isidro Gil on the grounds of the Coca-Cola bottling plant in Carepa, Colombia. Gil was a leader of SINALTRAINAL in Carepa. Cardona was kidnapped by the paramilitaries, but managed to escape and make his way to the United States. "Coke has been claiming for over two years now that the ILO would do an investigation, but the company has yet to even set a timeline or terms for this investigation. In April 2006, the University of Michigan reinstated Coke products on their campus, calling for Coke to complete an assessment of the conditions in by March 31, 2007. Coke missed that deadline, and another year has passed. It is clear that an investigation will not take place even by the ILO, Coke's preferred choice, unless increased pressure is put on Coca-Cola." "Coca-Cola, one of the sponsors of the relay, chose Ms. [Majora] Carter, 41, to carry the torch in San Francisco, its only United States stop, because of her environmental activism. Ms. Carter started an environmental action group, Sustainable South Bronx, in 2001...Five seconds into her run down Van Ness Avenue, Ms. Carter pulled the Tibetan flag from her sleeve and began waving it. There she was, a mole at the head of the procession." "The brainy South Bronx activist [Majora Carter] who stirred an Olympic torch-bearing ruckus in San Francisco said Thursday her conscience fueled her surprise anti-China protest...'I figured it would not be smiled upon, but I thought it was freedom of expression,' said Carter, 41, a 2005 recipient of a prestigious MacArthur genius grant. 'As a civil rights activist in this country, I could not have these privileges and not use them,' Carter told the Daily News. 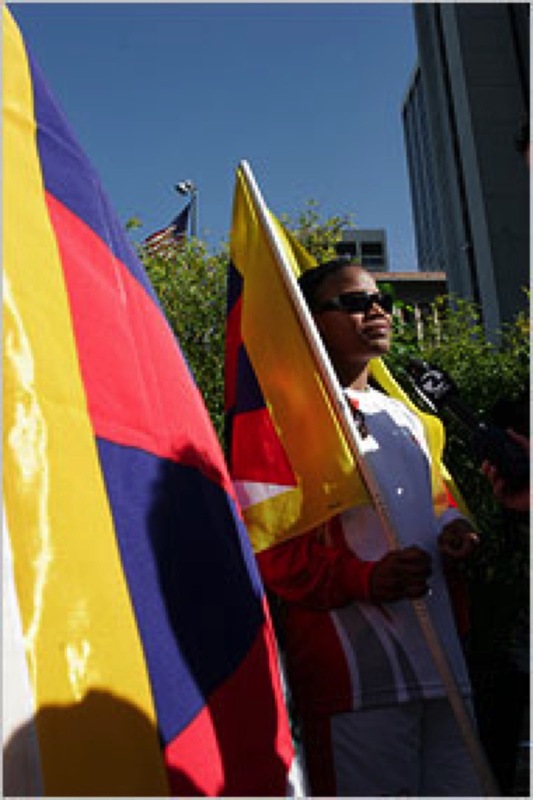 "One of three New Yorkers chosen to bear the Beijing Olympic torch in San Francisco on Wednesday...she pulled a Tibetan flag from her sleeve to protest China's human rights abuses in the Himalayan province." "This is a modern day 'David vs. Goliath' story. Coca-Cola has refused to have a professional vs. professional debate. They will only debate their professionals vs. the non-killercoke student professionals! And the post-debate report is... SUCCESS!!! Students Against Coke soundly defeated Coca-Cola's public relations reps!" "According to Under Graduate Student Government President Anthony Hernandez, the chairperson for University State Senate, Robert Ramos, will be visiting Baruch soon to discuss the Coca-Cola boycott, which will ultimately decide the future of Coca-Cola products on campus. 'If the USS, which has the primary say on campus activities, votes to kick the product off campus, Coca-Cola products will not be welcome here any longer,' he explained." "...resolved that the Graduate Student Organization support the efforts of the UUP in pressing for the termination of contracts with Coca-Cola on campus." "Harry Lindner, who was a member anti-Coca-Cola group, said the company abuses human and worker rights in places like India, Colombia and El Salvador. 'It's not just about getting rid of Coca-Cola," Lindner said. "It's about cleaning up business practices that are wrong. It's about treating the community with respect.' Eddie Klatka, also a member of the group, said that Coca-Cola exploits children in El Salvador. 'Right now they are using children in sugar cane fields, which most people think child labor is,' Klatka said." "OSU is believed to have the largest single university contract in the nation. That contract expires in June. It has been reported that in an exclusive contract arrangement, OSU has received $30 million over the past 10 years. It was also reported in 1999 that Coke received $29 million in revenues in just the first year of the contract. In addition, Coke benefits from free advertising and promotion of its brand name throughout the campus and at sports and other events." 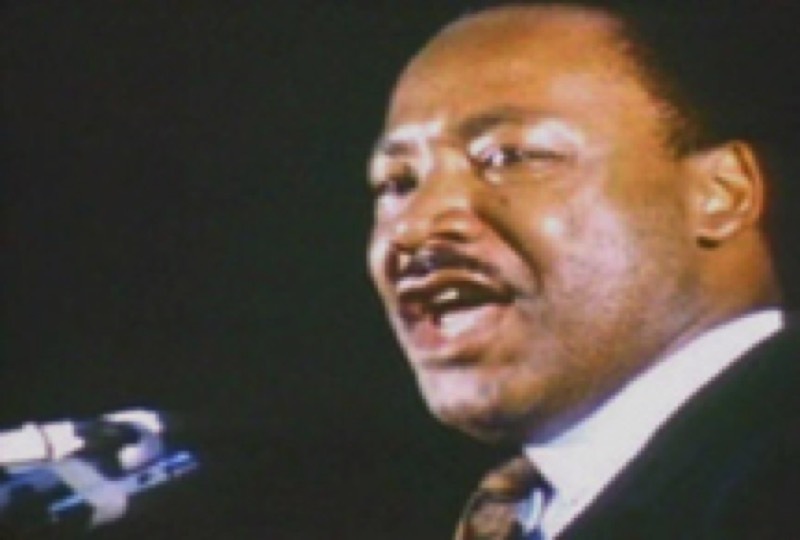 On this 40th anniversary of the assassination of Dr. Martin Luther King, Jr., we are linking to his "I've Been to the Mountaintop" speech delivered on April 3, 1968, the night before he was shot, in which he called on the people of Memphis to boycott Coca-Cola because "they haven't been fair in their hiring policies." It should be noted that in 2000, more than three decades later, Coke settled a lawsuit for $192.5 million brought by their African-American employees charging racial discrimination and there are similar lawsuits pending. "Always anchor our external direct action with the power of economic withdrawal...And so, as a result of this, we are asking you tonight, to go out and tell your neighbors not to buy Coca-Cola in Memphis...As Jesse Jackson has said, up to now, only the garbage men have been feeling pain; now we must kind of redistribute the pain. We are choosing these companies because they haven't been fair in their hiring policies; and we are choosing them because they can begin the process of saying they are going to support the needs and the rights of these men who are on strike." "Over 1500 villagers marched to the Coca-Cola company's bottling plant in Mehdiganj in Varanasi in India yesterday demanding that the bottling plant shut down immediately...'Coca-Cola, Pepsico and other companies are plundering our natural resources. Water sustains life, and without water, life in not sustainable. The time has come to put an end to the misguided expropriation of our natural resources and assert the right to water to the communities to whom it belongs,' said Medha Patkar of the National Alliance of People's Movements, who led the march and rally." "* 2006: Protests in Italy force torch bearers for Turin`s Winter Olympics to change route four times during a two-month trip across Italy. 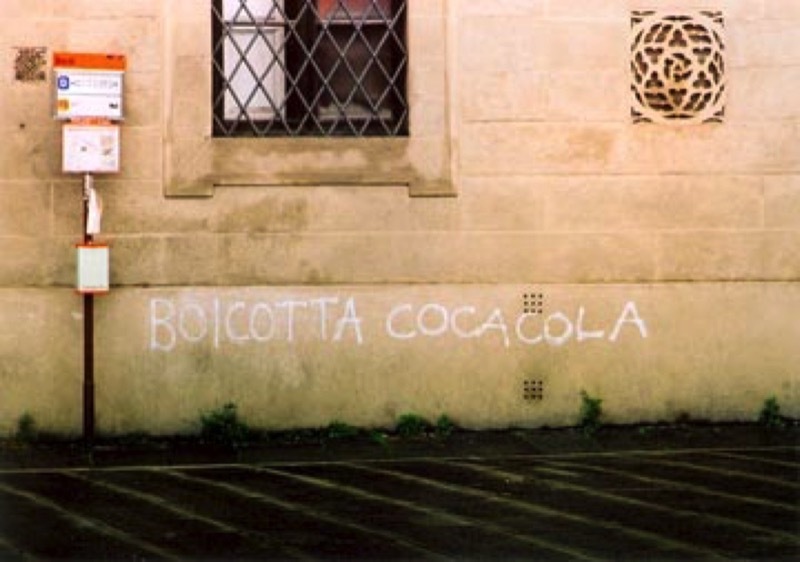 Protesters voice opposition to U.S. corporate giant Coca Cola`s sponsorship of the Games, US First Lady Laura Bush`s related visit and the construction of a high-speed railway from Turin to France. "* March 2008: Human rights protesters try to disrupt the torch-lighting ceremony in Greece on March 24. Exiled Tibetans pledge to demonstrate against a security crackdown in Tibet and parts of western China after a wave of anti-government protests. China says there are no plans to change the torch`s two scheduled visits to Tibet." "McDonald's, Coca-Cola, Samsung and other sponsors paid tens of millions of dollars to link their names with the Beijing Olympics. Now, they're trying to mollify activists pressing for change on Tibet, Darfur and other issues, without angering China. They have expressed concern over Tibet; some even talk privately to Beijing organisers. But sponsors insist they should stay out of politics. "Until last week, the sponsors' biggest concern was pressure over Darfur. Fronted by actress Mia Farrow and employing disciplined public relations strategies, Darfur activists have been prodding sponsors to lobby Beijing to help pressure Sudan to end the conflict." "Groups have decried China's policies in other areas, particularly Darfur. But the pro-Tibet network, spread around the world, is more organized and interconnected than other groups, and advertising consultants and political scientists, say its influence is expected to keep the issue of autonomy and violence in Tibet front and center for weeks...'We feel that using the torch relay to put political pressure on China is not appropriate, Ms. [communications manager for Coca-Cola, Kerry] Kerr said. Still, Coke has had several meetings with protest groups, she said, and is sharing the groups' concerns with the International Olympic Committee." However, iIt should be noted that large Coke shareholder B. Wardlaw predicted this problem four years ago at the 2004 Coke shareholders' meeting: "As far as my proposal on China business principles which I am bringing to you for the third time [His proposal was voted down all three years by the shareholders. ], I introduced this proposal because I, along with many other socially conscious shareholders, are concerned about Coke, its reputation and its share price. As I've said here the last two years, we seem to be heading toward possible public relations calamity in China. So just looking at it from the viewpoint of the company, it makes sense for us to spend more time thinking about, before we go in, we're spending over a $1 billion, what over the last 20 years in China, developing products there. The Olympics are coming to China in 2008 in Beijing. This is a moment where Coca-Cola is going to be highlighted because of our close involvement with the Olympics and the, as someone has said, as a recognized product in the world. I think what is happening, is that we are still not, as a company, paying enough attention to what could happen in China. Every human rights abuse possible has been committed in China..."
"Former international sportsman Derek Vaines, 71, of Bournemouth, who represented his country at judo, said: 'Athletes shouldn't go to China. Its human rights record is deplorable. All China is going to do with the Olympic Games is wave its own flag and proffer its own position. If I was in my twenties and competing at an international level, I certainly wouldn't be entertaining going on any sort of game-playing exercise in Beijing.' 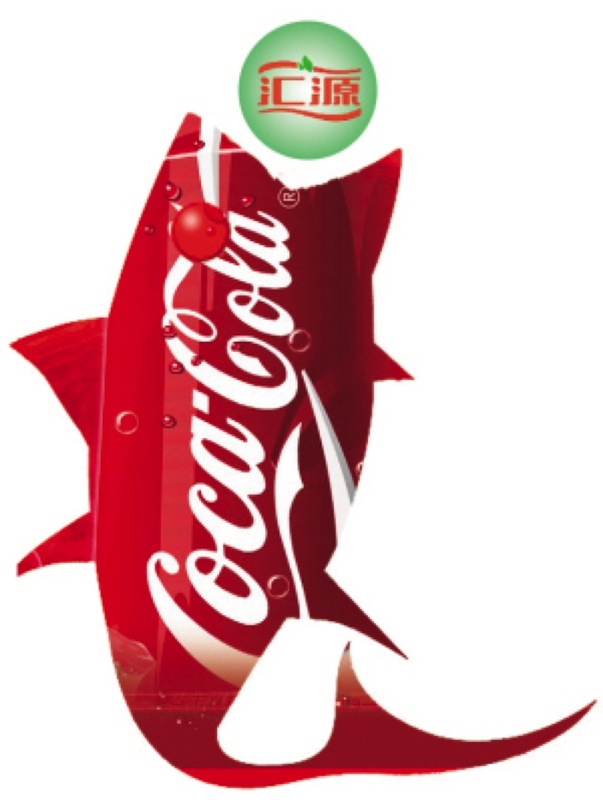 Mr Vaines urged other people to join his boycott of products made by Coca-Cola, which is sponsoring the Olympic torch." Read Campaign to Stop Killer Coke on "Coke, Darfur, Tibet & the Chinese Olympics"
"Sponsorship for the torch relay is separate from the Games itself and usually costs about $15 million to $20 million, say people in the industry. Torch sponsors can spend an equivalent amount building marketing campaigns around the relays. Coca-Cola, a six-time torch sponsor, with an abominable record on labor, human rights and environmental issues, is not about to allow human rights protests to undermine its marketing efforts. "Most company sponsors said it wasn't their role to advise China on political policy..." reported the Wall Street Journal (3/17/08). "Marketing trade publication Brandweek predicts that Coke and Pepsi will fight the growing backlash against bottled water with intense "ethical" or "'responsible" marketing, understood as tying the purchase of a product to charitable activities. A number of ad campaigns for bottled water already include charitable ties. According to Brandweek, the use of A-list celebrity endorsements of these types of campaigns is likely to increase." "UVM is a campus full of Coca-Cola products, including Coke, Dr. Pepper, Vitamin Water and Odwalla bars. Justin Hurtt, who is leading up the effort to kick Coke off campus, says other students are frequently surprised to learn just how many products are made by the Coca-Cola company. He says getting them to give up the products might take a bit of convincing, but he's sure it can be done.
" 'I believe we can be able to do that here at the University of Vermont,' says Hurtt. 'I believe that we should if we want to hold up to our code of conduct and be able to promote ourselves as a progressive and a sustainable college.' "
"After six years of marching, chalking and petitioning, members of No Sweat! are optimistic about their campaign to kick Coca-Cola off campus.No Sweat! is the IU chapter of United Students Against Sweatshops, a student group working to combat sweatshops and corporate globalization at a local level. "In the group's most recent campaign, members are protesting the University's contract with Coca-Cola in response to allegations that the company has been using torture, murder and kidnapping to intimidate their workers at a bottling plant in Colombia, said junior Cole Wehrle, a No Sweat! member. Group members said they believe if the school discontinues its contract, it can send a powerful message to the company." "Just to recap, there have been numerous allegations of serious human rights violations leveled against Coke over the years. These criticisms range from racial discrimination and monopolization to health hazards and even questionable connections to Nazi Germany. However, some of the most serious and most publicized affairs deal with the company's practices in the countries of Colombia, India, and El Salvador." "Now, one more brand name has been added to the boycott list. On February 5, Coca-Cola purchased 40 percent of Honest Tea, making it the most monetarily influential shareholder of the 10-year-old tea company...But the Honest Tea era at Oberlin is now a thing of the past. On Sunday, Feb. 24, the five flavors of Honest Tea were evicted from their home in the DeCafe refrigerators. They have been replaced by five styles of TEAS' TEA, a zero-sugar, zero-calorie brand produced in Japan." "Coca-Cola has been the target of a boycott at Oberlin College since 2005, and now a national group is trying to rally Ohio State University students to pressure administrators to get out of a Coke contract there. "A group called Students Against Coke has formed in Columbus, and last month about 100 students showed up for a meeting there. Ray Rogers, director of the New York-based Campaign to Stop Killer Coke, said he and other organizers are hoping to have several more meetings before a contract between Coke and OSU expires in June. "The group says Coke has environmental and human rights issues in Colombia and India. 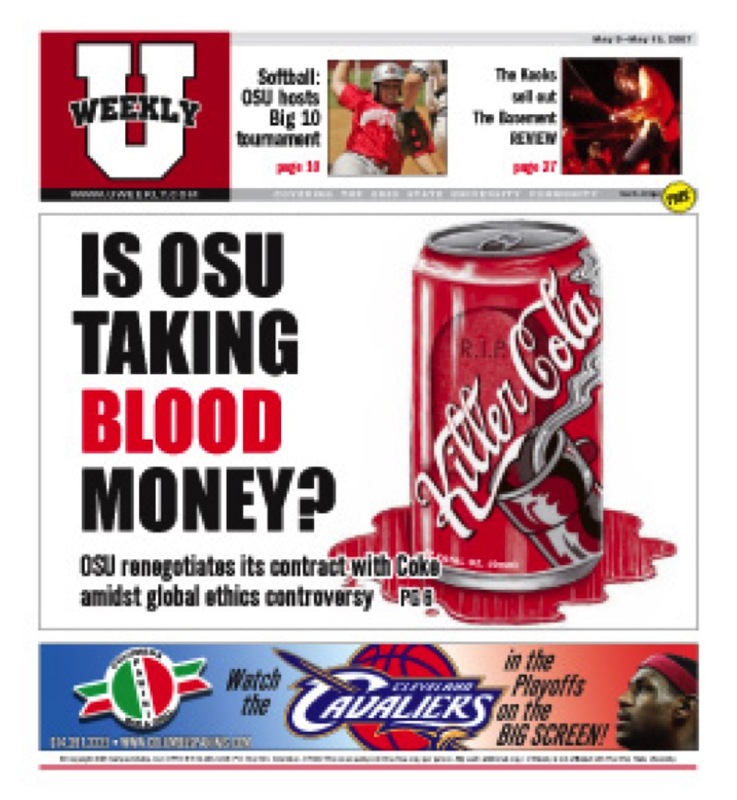 A spokeswoman for Coke told OSU's student newspaper that the claims are taken out of context and said government agencies have found no truth to other claims. "Shelly Hoffman, an OSU spokeswoman, said the current contract, which expires June 30, is a $30 million, 10-year contract. 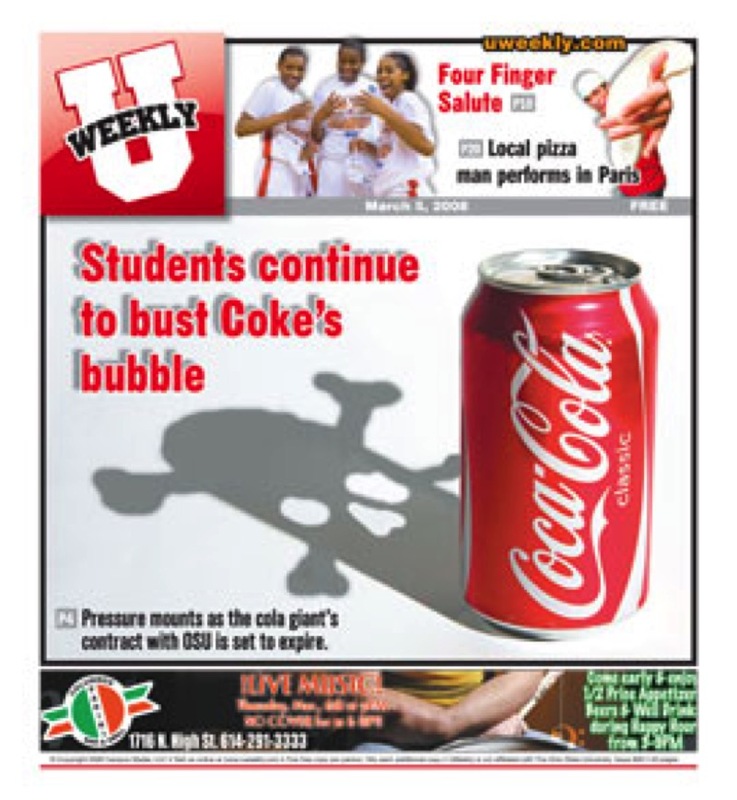 "In exchange, Coke provides "cash and services" to the university and student groups." "Nandlal Master, Lok Samiti, Mehdiganj and Sandeep Pandey and National Alliance of Peoples Movements said, 'We demand community centred solutions to the water crises and insist that communities must have primary rights over water.' The community of Mehdiganj and Coca-Cola affected communities in India are working with communities, elected officials, local, state and national government officials, people's movements, non-governmental organizations and international groups to challenge the eroding right to water and asserting the fundamental human right to water." "We will not have our members pay high costs for health care while Coca- Cola still gives out fat consulting agreements to executives who no longer work for the company," said Jack Cipriani, director of the Teamsters Brewery and Soft Drink Workers Conference. "Our members are loyal, hard working people who deserve excellent health care and good wages. We are here to fight for them." "Is this a conflict of interest by Peter Ueberroth? "'Boycott the opening of the Olympics. Contact the sponsors. Tell Coca-Cola you're switching to Pepsi, or tell McDonald's you're going to eat at Burger King,' she [Mia Farrow] said. Other sponsors she cited included Budweiser and UPS. "But U.S. Olympic Committee chair [AND ONE OF 13 MEMBERS OF THE COCA-COLA CO. BOARD OF DIRECTORS] Peter Ueberroth said in Atlanta recently that he wants American athletes to focus on being good guests, not outspoken reformers, according to an Associated Press story. Is this conflict of interest by Whitefield? "Her [Trice Whitefield, Center for Consumer Freedom] letter seemed to completely miss the point of the editorial, and instead took the ludicrous position that each individual is immune to peer pressures, mass marketing and other cultural effects that shape our eating habits. "It doesn't surprise me that Ms. Whitefield espoused such a narrow-minded worldview: She's being paid to push it. You see, the Center for Consumer Freedom receives their funding from companies such as Coca-Cola, Wendy's, and Outback Steakhouse." "But American corporate executives will find it less easy to cop [International Olympic Committee President Jacques] Rogge's plea of ineffectuality, and they certainly can't plead that they are 'apolitical.' Seven of the top 12 Beijing Games sponsors are American, and they have poured money into the event in return for Olympic-sized access to the Chinese market. You should know who they are: Visa, Kodak, Johnson & Johnson, McDonald's, General Electric, John Hancock and Coca-Cola." "A Covenant on the right to water would serve as a common, coherent body of rules for all nations and clarify that it is the role of the state to provide clean, affordable water to all of its citizens. Such a Covenant would also safeguard already accepted human rights and environmental principles...No country needs to be held more accountable to this crisis than the United States. 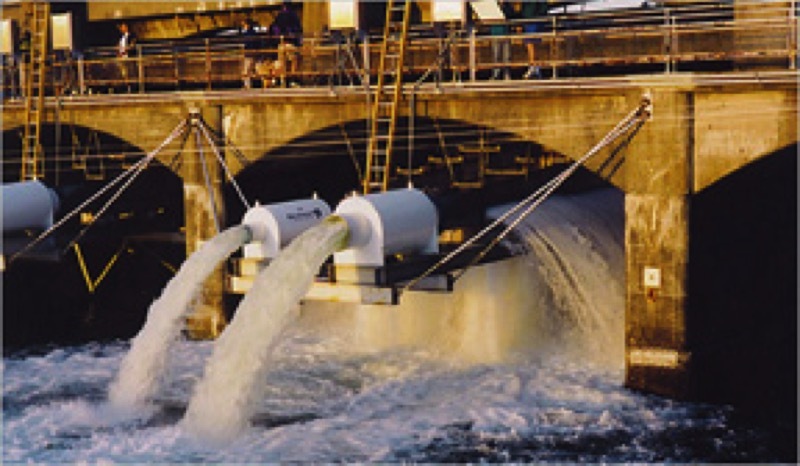 Many of the companies privatizing water are based in the United States and the United States is among the chief backers of the privatization strategy through the World Bank and other mechanisms. If we are to stop this crisis, the United States government must become part of the solution, not the problem." Students for Peace and Global Justice are working to make sure that UVM buys products from companies who follow its ideals of ethical and environmentally sound practices. However, they are currently working to remove Coca Cola from the UVM campus. 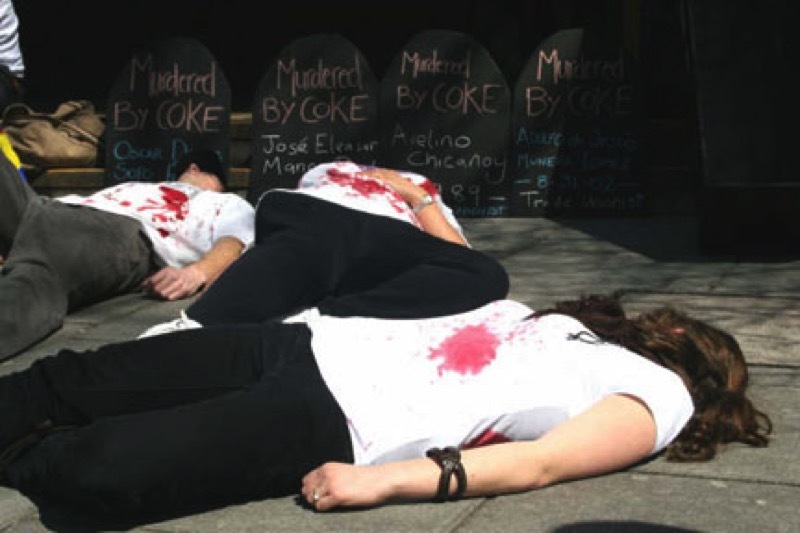 Students for Peace and Global Justice have joined the US campaign against Coca Cola called 'Killer Coke'." UK "Join and pledge to BOYCOTT COCA-COLA!" "A video about how coke kills workers in Colombia and harms everyone who drinks their products. Music by NOFX." "Moreover, various taste tests have shown that a lot of people actually prefer tap water to the store-bought stuff. And there is a use-or-lose-it aspect to tap water. The best way to ensure that we continue to have potable water — when so many around the world don't — is to keep drinking it. Relying on public water spurs us to care about it and to keep tabs on the municipal authorities that monitor both it and the pipes it travels through to our homes." "Coca-Cola has been widely criticized for their alleged involvement with the assassinations of over half a dozen union leaders who worked at Coke's bottling plants in Colombia. Since 1990, Coke continues to deny any connection to the eight murders. In addition, the Coca-Cola Company is one of the three largest water privatizing entities in the world, restricting access to water and allegedly poisoning local water supplies around their plants in India." "Coca-Cola has changed 180 degrees from its position on aspartame in 1980. At that time it testified in opposition to aspartame's approval at FDA hearings looking into the safety of it. Now they help finance its defense. Of course, the FDA itself has flipped. Its initial denial was reversed a few years later in 1983, when Donald Rumsfeld (ring a bell?) persuaded the Reagan administration that denial was not bad chemistry but bad politics. At that time Rumsfeld headed Searle, the pharmaceutical firm that helped develop aspartame." The University of Michigan and Coca-Cola agreed to commission the TERI report after students argues that Coke's water-management practices violated the university's code of conduct for vendors. UM was among the largest of more than 46 colleges and universities that removed Coke products from campuses because of flagrant corporate irresponsibility overseas, particularly in India and Colombia. Lawsuits filed in 2001 and 2006 by the International Labor Rights Fund and the United Steelworkers Union, AFL-CIO, charging Coke bottlers' complicity with Colombian terrorist-paramilitaries who have kidnapped, tortured, illegally detained and murdered members of the SINALTRAINAL union, are proceeding - and so are the students, labor and environmentalist protests that TERI's report utterly fails to quell. "Students Against Coke sponsored a forum, "Coke and You," Wednesday night that accused Coca-Cola of human rights violations in Colombia, the exploitation and pollution of water sources in India and other environmental and ethical infractions. Coca-Cola declined an invitation to the event, saying they refused to put themselves "in a public forum with professionals ... with false information and graphic videos." A company representative denied all accusations made by SAC. "I was at first skeptical of the accusations he [OSU Student Eddie Klatka] made against Coca-Cola. He said the corporation 'has a laundry list of human rights and worker's rights violations extending around the world,' that, in India, Coke is 'continually polluting villages, where their bottling plants are located, with toxic waste' and that, in Colombia, union leaders have been killed or threatened with murder. This all sounded very serious and far-fetched, so I did some independent research..."
" 'As a 21st century land-grant university, The Ohio State University will set the standard for the creation and dissemination of knowledge in service to its communities, state, nation and the world. Our faculty, students and staff will be among the best in the nation. [OSU's Mission Statement]' How then are we, OSU students, faculty and staff, able to allow a contract with corporations, such as Coca-Cola, whose business practices are unethical and immoral? The Coca-Cola Corporation has a laundry list of human rights and worker's rights violations extending around the world. The countries of India and Colombia are most affected by Coca-Cola's actions. This article is to inform the OSU community about the dangers of re-signing the contract between the university and the Coca-Cola Corporation." Matt Beard, A Justice Film, "The Cost of a Coke"
Watch Part 1 of "The Cost of a Coke"
Watch Part 2 of "The Cost of a Coke"
Watch Part 3 of "The Cost of a Coke"
"The naives eschew tap water either because of snobbery (a water that anyone can drink isn't exclusive) or because they worry about the purity of the city's pipes. They choose bottled water that — under the same regulations as packaged food — is checked by the Canadian Food Inspection Agency probably not every week or even month. I trust municipal tap water that's analyzed every 45 minutes. It's so good, the Coca-Cola people make Dasani from municipal water. They filter it some, then add minerals for flavour. Their fake water costs 3,000 times more than what flows from the wall." " 'Coca-Cola uses all these Orthodox symbols in a blasphemous way by placing images of Coca-Cola bottles inside the pictures,' the letter said. 'Some [church] images are deliberately turned upside down, including the crosses.' "
" 'Coca-Cola uses all these Orthodox symbols in a blasphemous way by placing images of Coca-Cola bottles inside the pictures,' protesters said in a letter to local officials last month. They said some church images were deliberately turned upside down, including the crosses." CSPI Newsroom, "Consumer Groups in 20 Countries Urge Coke, Pepsi to Limit Soft Drink Marketing to Children: Cola Promotion in Elementary School Physical Activity Program Cited"
"The group, at a press conference in Mexico City on December 10, exposed an elementary school nutrition campaign sponsored by Coke that portrays Coca-Cola as one of several beverages that can be used for hydration after physical activity. The campaign's organizers are urging consumers around the world to alert them to similarly misleading marketing efforts by Coca-Cola or PepsiCo in other countries." " 'Hitler,' or at least 'Hitler's boy,' was Max Schmeling - who defeated Louis in 1936 and in the 'fight of the century' two years later at Yankee Stadium was TKO'd in the first round...'Max Schmeling had a Coca-Cola franchise in Germany and sat on the board of directors in Hamburg. Yet in the democratic United States, Coke wouldn't sponsor Joe Louis because he was black.' "